Use this American Metalcraft 3806 6" x 3" round aluminum cake pan for all your bakery, cafe, or restaurant's cake creations. Made of heavy weight, 14 gauge (1.5 mm thick) aluminum, this pan is sure to be a durable and reliable addition to your establishment. The material of this pan heats quickly and evenly distributes heat. This means your cakes and creations are always cooked thoroughly and evenly, and you won't have to worry about the pan warping. Well made cake pan. I like to use 3" high pans versus 2" high pans so cakes have more room to rise and level out. I strongly suggest not putting these in the dishwasher! These pans are incredibly heavy duty, and much better quality than other pans on the market. I love the added height compared to 2" pans, as I get more bang for my bake and things move along faster in the kitchen. I have 8 of these 6" pans in my small bakery and use them constantly with no loss of quality. The lipped edge helps make them easy to hold, and they clean up easily. The aluminum lends itself to an even bake, so you don't end up having to cut off your burnt outer edge like with other, higher-heat pans. Plus the price is incredibly affordable and can't be beat. Highly recommended for every kitchen, big or small! This pan does a great job. I needed an extra 6” pan and pans can be a little costly. I was sure how this pan would bake my cake. So I gave it a shot. Happy Customer! These baking pans are amazing. They are such great quality and so well made that it will last you a lifetime. They're very strong and very easy to clean. I love how deep they are too. Cakes come out perfectly in these, I have had no issues baking all types of cakes. I highly recommend these pans for baking cakes. Great cake pan for our allergy-friendly cakes. Cakes always come out perfectly and never stick in the pans. We have two so far but will definitely buy more when the time comes! Very durable and bakes even all around. The pans carry a little weight to them so that enhances the quality and the durablity of the pan. Wow! This is a wonderful pan. Bakes well, nice depth for 1 bake and slice layers. Saved lots of time with one. Highly recommended. Small Bundts, personal sized Bundts works well too and look rustic. This is a great pan by a great company. Good even baking. Sides are indeed straight! Last straight pans we bought had a slight curve. These are perfect. I wish they stacked but they are actually straight so it is worth the small hassle. I love these pans. I can make my smaller cakes taller with these pans and not have to worry about them overflowing in the oven. This cake pan provides excellently baked cakes. The depth allow for fewer pans this saving money. Even and precise baking provide a uniform and desirable cake. Perfect tall cake layers every time! Great price and the quality of the pan is amazing. I wondered if the quality would be comparable to other brands and it has been a great investment! Thick, well made and great price. It is hard to find 6 inch width and 3 inch high cake pan in stock in our area. Thanks. These are great 3" tall pan!! Love that I can bake taller layer and reduce cake dome waste since I can torte the taller layer in to 2. This cake pan is really great. I was looking for 6 inch round cake pan and I found it here with great quality and price.! I am very pleased with the American Metalcraft 6" x 3" pans. I used them to create a three dimensional minion cake. I love the depth and I always have the option to only fill with enough batter for a 2" tall cake. I found the pans to be heavy weight and they appear to be very durable. This is important to me because I often travel with all of my cake making supplies, including my pans. These held up very well on their first trip to a 'create on location' cake job. Great quality pan, and the price cannot be beaten, I love these pans you can even use them without grease and just slide a knife around the rim when done. Great quality pan and at reasonable price. i have a few in my collection which means that i do not have any regrets with it's quality. One of my new favorite pans. The cake come out smooth and effortless, barely any sticking. I will definitely be purchasing the other sises that are available. These are so far the best 6 inch cake pans i have purchased! i like how they are a little taller then average cake pans. Don't have to use as many if you have a lot of orders you get two perfect layers out of one. It is a great cake pan. It is designed for heavy duty, It conducts heat very well and with the straight sides our cakes always look beautiful. This American Metalcraft 6" x 3" round cake pan is thick and heavy duty. I have never used a 3" tall pan before and think using a heat core would be helpful. I do like how evenly it baked my cake. the pans are very nice! They have nice sharp edges when they bake. The aluminum is a little thin compared to Magic Line pans, but they are a fraction of the cost. These don't bake as evenly as a higher quality aluminum pan. We don't use this for cakes, we use it as a mold and as such the heavy weight far out performs other molds. Think of cake pans for your biscuit cutters and such in the future. I just adore these cake pans. I have 3 sizes and have used them to construct towers wedding cakes to small birthday cakes. A great purchase. 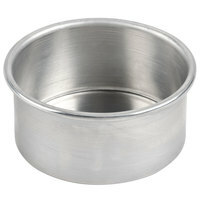 American Metalcraft 3806 6" x 3" Aluminum Round Cake Pan is perfect for mini cake. I love this product it is non stick cake pan and sturdy enough to hold your cake batter. Value for money, i am totally happy with my purchase. Cannot say enought good things about these cake pans. Great quality, They bake evenly and are still looking good after 3 months of regular use. Prior to this purchase, I only had a 6 x 3 in a cake ring. I have a few of these pans in various sizes made by American Metalcraft. They are lightweight but bake well. Love them... Could not have asked for more. Bakes great and no burns. I dropped one and no dents at all. Love this cake pans. I use this for my cake smash cakes, kids love small cakes and this size is perfect. This is sturdy unlike any other cheap brand ones. Hands down to this cake pan. This pan is thick, which I like the most. Prefect works with 6`round liner. I only use bottom liner, and cakes can come out easily with prefect looking even with out side liner. Best cake pans for the money! You can't beat the quality and the price on these. We use them in a variety of sizes and haven't had any issues with warping or uneven heating. These pans are awesome! The aluminum promotes even heating all around, and makes for a perfectly baked cake! For the price you can't beat it! This pan is an excellent, heavy duty quality. I was very impressed with what I received for the price, and it certainly excelled in comparison to the Wilton brand pans by thickness and durability. Though I am just a hobby backer and can't comment on longevity, I am impressed with this pan thus far and would highly recommend it! I love these pans. Bought a couple of these for my mother and they are really sturdy and the quality is nice. Would reccommend anyone to buy them. These cake pans are sturdy. I love using them as the cakes cook evenly. Also love that these are 3 inches tall so that my cakes have some height. Easy to clean as well. I love these pans. I bought multiple in each size for my bakery. They cook my cakes wonderful and never have a brown adge on them ! This is a great pan for making smaller layer cakes without worrying about the batter overflowing. I have several and use them often. Very happy with this purchase. Heavy and solid cake pan. Great for the top of a wedding cake or a mini birthday cake. My cakes bake nice and even I plan on ordering more soon! Love this pan! These pans do not stick and easy to get the cakes out. Most importantly, super easy to clean. I would highly recommend for bakers. Very heavy duty and overall a very nice pan. This is a wonderful price and don't let the low price fool you, these are not like those flimsy novelty pans you see. I deducted 1 star however do to the lip on the top of the pan, the pan I received wasn't a perfect circle so the lip on top wasn't curled completely in some places and it let water get into it so I am worried about bacteria in the future. Luckily that part of the pan does not touch the cake or I would have deducted more. I love these cake pans! They are high enough that I only need to bake 1 and I can make a 3 layered tort with them. They are just great cake pans! These are great cake pans. Sturdy, well built, and super straight sides. They are heavy weight aluminum so they conduct heat extremely well and bake evenly. My cakes come out perfect every time! These cake pans are great for making tall cakes. The quality is very good and they have a good weight to them. I chose the 3" tall pans over the 2" so that I only had to use 2 pans and it doesn't bake over. I did struggle a bit with seasoning the pans but that was user error. I love these and they are such a good price! I LOVE using this mold to make smaller cakes for our cake display.. Bakes the batter well and evenly. Need to buy a couple more since I only bought one to try it out.. I would def. recommend this pan to anyone looking to purchase a pan in this size. The American Metalcraft 3806 6" x 3" Aluminum Round Cake Pan are very durable and bake the cake evenly. I brought different sizes and they work very well doing a tier cake. The price is awesome. I was a little skeptical at first. But after using it to make the top tier of a wedding cake, sold!! It baked the cakes so nicely and pretty even on top. Love it!! This is a great cake pan with a super smooth interior that allows for easy cake release. I have a few different shapes and sizes made by the same company, and they're all wonderful. This is a heavyweight cake pan. You can make 1 cake and divide it by 3 or 4 and have a very impressive tall cake. What I love about American Metalcraft 3806 6" x 3" Aluminum Round Cake Pan is that it is nice and tall so I can make 1 cake and slice it into 3 1 inch layers for a layer cake- great buy! I am 100% in love with these pans. Generally when you buy cake pans, they are angled on the sides and about an inch shorter. The dimensions of these pans in absolutely perfect for layering. I am new to the world of 3" cake pans. But, I am SO glad I found them!! These, when torted and filled, give me the same size cake tiers as I was getting from baking 2 pans of cake before, in the smaller pans!! SUCH A TIME SAVER! Love these cake pans! I bought these thinking they wouldn't be so great, but I liked the price and I shop on this website ALOT! I was definitely blown away. I love these pans. I bought several different sizes and none of them have disappointed. Absolutely perfect for smash cakes for baby's first birthday!! Its the perfect size, just large enough to do a small decoration on but not so large that the cake is wasted when the child doesn't eat most of it. A sturdy little pan, perfect for baking 6" cakes. A spritz of baking spray keeps cakes from sticking, and it comes clean after use fairly easily. this round aluminum cake pan is made very well. it heats very even and cools pretty fast as well. and for the price you really cant go wrong. This is a good quality little pan. It's thick enough and won't loose its shape. Sometimes I make 6" cake and those pans are perfect for a high cake. Great cake pans! Super sturdy and heavyweight. The 3" height creates nice cake layers. Cakes bake evenly without darkening too much. Would definitely recommend these pans! I really looked everywhere for these pans at a better price, however, I found that Webstaurant is the lowest anywhere! For the quality and the integrity of the company.. you can't find a better place! LOVE LOVE LOVE THESE PANS...I had been searching for 3 inch deep pans for over a month and finally did a Google search and found WEBstaurant AND these beauties. They are everything I could ask for: deep, flat/even cake layers, heavy, no dents from shipping. I used them to make red velvet cheesecake because I did not want to use a spring form pan for fear of leaking. I love the 3" pans. You can use them for single layer cakes or double layer by pouring and baking twice. To bake perfectly flat cakes, I wrap the sides of the pan with wet strips of toweling. This keeps the edges from baking too quickly. These small cake pans are great for baking cakes. They are very inexpensive and will last for a very long time. People have even been known to have these for generations of bakers! Great cake pan nice for making small stacked cakes. The 3 inch size allows me to bake one layer instead of 2 for each layer. As with the 9in pan, this pan is made out of high quality aluminum. I have never burned the sides or bottoms of my cakes. I would recommend this to any baker. This is a nice, deep, heavy duty cake pan. It is a smaller size. I am not a professional baker, but I love having quality equipment in my kitchen and American Metalcraft makes extremely high quality products at great value prices through Webstaurant. This size is about the size you would think the top layer of a wedding cake might be. Super great value. The aluminum construction is great and it feels solid and stable. My cakes bake evenly and come out perfect. The price is unbeatable. Works great! This is a great pan. It's a good price for the quality as well. I bake a lot of cakes and I highly recommend it. I absolutely LOVE these pans. I had a problem with my cakes not rising high or baking evenly until I bought these pans. Now my cakes bake evenly and I can even make high yield cakes because of the 3" high walls. for the bakers and hobbyist...this is a professional cake pan that will yield good result...I used it for baking my fruit cakes for give away this holiday.